Millennials are coming of age at a time when work is temporary, underpaid, incommensurate with their education, or downright unsatisfying. Despite these challenges, media scholar S. Craig Watkins argues that this moment of precarity is rife with opportunities for innovation, and that millennials are leading the charge at turning that into an inventive and surprisingly sustainable future. At the intersection of ethnography, sociology, social history, and pop culture, Don’t Knock the Hustle is one of the first attempts to document how millennials are building a creative, entrepreneurial, and civically engaged innovation economy. Here, we meet people like Prince Harvey, a hip hop artist who recorded his album entirely on an Apple showroom laptop; screenwriter, producer and actor Issa Rae, who first used YouTube and Kickstarter to develop the web series that became her hit HBO show, Insecure; and start-up companies like Qeyno Group in San Francisco and Juegos Rancheros in Austin, TX that help make tech more accessible to people of color. 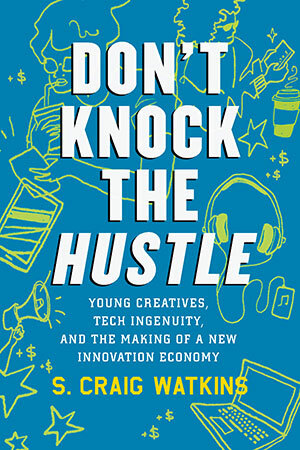 Don’t Knock the Hustle offers a timely analysis of the sheer ingenuity and persistence of young people who cobble together the resources they need to pursue the lives and careers they want. Drawing on over 10 years of interviews and data, Watkins reveals the radical ways in which our society is expanding who we think of as innovators, what qualifies as innovation, and the spread of wealth beyond traditional corridors of powerful tech companies, venture capitalism, and well-endowed universities. Forward-thinking and dynamic, Don’t Knock the Hustle shows the diversity and complexity of a generation on the rise. —Daphne Kwon, president and COO, Studios at Betaworks, Inc.
Code for Change: Who Will Build the Smart Future?